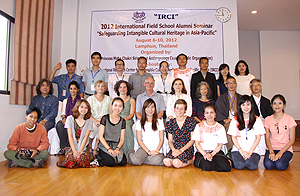 This international seminar was held in Lamphun town in Northern Thailand, from August 6–10, 2012, under the joint sponsorship of the Princess Maha Chakri Sirindhorn Anthropology Centre, Thailand, and the International Research Centre for Intangible Cultural Heritage in the Asia-Pacific Region, Japan. MIYATA Shigeyuki from the Department of Intangible Cultural Heritage participated in the seminar as a guest Resource Person. In the seminar, young experts from Thailand, Cambodia, Vietnam, China, and Bhutan, who are involved in museum management and anthropological studies took part in practical case study reports and discussions, and fieldwork studies. Researchers from Thailand, the U.K., the United States and Japan also participated as Resource Persons, and in addition to giving presentations, they also participated in the discussions. Since most of the participants are practically involved in safeguarding intangible cultural heritage in their region through their daily research activities in museums, their discussions were extremely lively and valuable, reflecting their high level of practical concern. It was also very encouraging for us Resource Persons to hear the fresh voices of the young experts who are at the forefront of research. This seminar is planned to be held in the same way yearly from next year on. As a result, the Department of Intangible Cultural Heritage plans to actively participate in the seminar in cooperation with the International Research Centre for ICH in the Asia-Pacific, and to contribute as experts on Japan.